A World War Two type 22 pillbox has been incorporated into the sea wall at Eccles-on-Sea and is visible on aerial photographs. 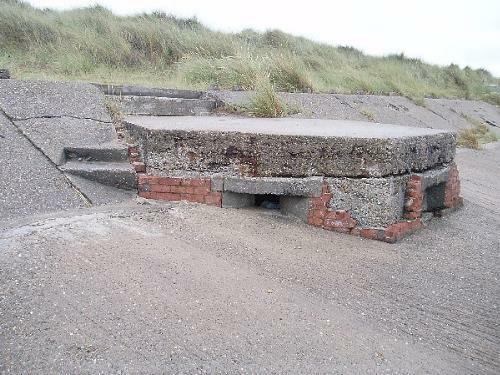 Common 1940 type 22 pill box incorporated into the sea wall at Eccles Beach. The central grid reference for this site has been altered from TG 4030 2959 to TG 4040 2953. The World War Two type 22 pillbox is visible on aerial photographs (S2-3). The structure is located at TG 4040 2953. In 1940 the pillbox is quite heavily camouflaged on the oblique aerial photographs of the site (S2), but can clearly be seen on the aerial photographs from 1952 (S3). May to November 2004. Norfolk Rapid Coastal Survey. Context 542. A Second World War type 22 pillbox was monitored. It was at TG 40402 29547 and has had a modern sea wall built around it. <S2> Oblique Aerial Photograph: RAF. 1940. NMR TG 4029/3 (MSO 31022 26/BR14/1 4855) 19-SEP-1940. <S3> Vertical Aerial Photograph: RAF. 1952. RAF 540/690 5046-7 11-MAR-1952 (NMR).